Exploding Doughnut: Reduction in force. Everyone knew it was coming but the news still left me disappointed and sad and not feeling like doing very much. Earlier in the week, HR informed hundreds of us in our city department that due to our new mayor's budget cuts we were being laid off at the end of the year. My layoff notice which I decorated with a yellow butterfly! This'll be my second time getting laid off so I'm sort of used to it. Yet as I walked to work today I couldn't help but hang my head. The city job wears me down a lot and I've always intended on leaving there in time but I wanted to go on my terms NOT theirs. And when I found out I'm working at the arts-and-crafts store on Thanksgiving Day, I wondered why I couldn't have lost that job and kept the city one instead. But I try reminding myself even though over a third of my income will now be lost, I'm fortunate enough to still be working elsewhere. Not many can say that. Maybe it's God's way of telling me I need to lessen my workload. Good luck with it all and I hope you find a way to replace the income that is not stressful. It's hard enough in this economy. I'm sorry to hear that it happened, but you're already looking at the positives it seems, less work at least. Oh, crap! But, you HAVE been working too much, and who knows what wonderful door will open now that this one is closing. 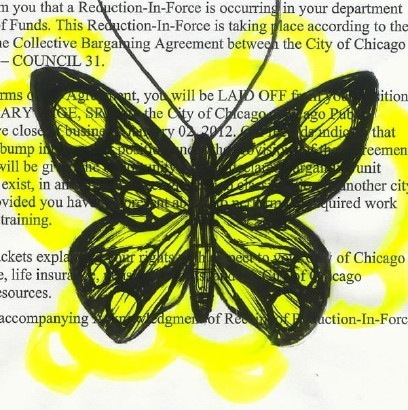 Anyway, I love the art you created from the lay-off notice. For I while you'll be able to collect unemployment I hope. And yeah, at least it does give you some time to work on your art. Having to work on Thanksgiving stinks. It's surprising that they get enough customers to make it worth opening the store. Are you looking for possible promotions/transfers/increased hours at the university? Well crap. I'm sorry Dean. I'm going to do the glass half full thing here. This leaves you time for your art. This also leaves you time for your love life??? Perhaps an opportunity to make art 1/3 of the time? Dean, you're one of the very! few people on this planet, everytime I read about them I dislike something I have to read, I think dear God when I will die and you havn't helped him, fear the day! Perhaps it is. I'm glad that you can possibly see the situation for its positive alternate reasons. Take care this week and Happy Thanksgiving. Why the butterflies all the time?Wasn't it your friend who made that her own and now you are over using it. I can't help to think that you made it your own. Not right for an artist that you so claim to be. Sorry you were layed off. I find it odd that they always do this crap around a holiday. I am glad you have an optimistic attitude though...yes you have work elsewhere. OK, we're dealing with unemployment in my house as well. But truly, who in the WORLD needs craft supplies on Thanksgiving????? Grin, grit and GET through it. Come over afterwards... I'll make you a Thanksgiving Sandwich. (wish you could!). Every door is an opportunity. You know this! Sounds like a great time to resume your art. Some days I'm down about it and others I'm grateful for what I still have. Just depends on my mood I guess. Decorating the lay-off notice was my way of turning something quite frustrating into something prettier and hopeful. I don't think I'll qualify for unemployment because technically once I'm laid off I'll still be working at my other two jobs. And yes, I notified my supervisor at the university I work for that I'm losing my city job and will be available should more shifts open up. LOL at more time for my love life. I never thought about that! God better look out when you get to heaven! (((HUGS))) back at you, girl! Happy Thanksgiving to you too, Kenny! I've had several friends in the past who've liked butterflies and I've been incorporating them into my art since college. If you look at some of my older posts I mention that butterflies represent a beautiful kind of freedom to me. I don't think any one person can "claim" an image as their own as you suggest. Monet with his water lilies, Degas and his ballerina studies, Frida Kahlo who painted skulls and other images depicting Mexican lore. Those things meant something to them so why wouldn't they use them over and over? Yeah, it's not a good time to lose a job. Not only with the coming holidays but winter is fast approaching too. People have gas bills to pay! I hope to resume selling my artwork online at the start of the new year once I officially lose my city job (January 2nd is my last day there). And I'd LOVE to have a Thanksgiving sandwich at your place! Brody, you bring up a good point. We were often told throughout the year about the city's budget problems (again) and were always left wondering if and when our jobs would still be there. That's why I started seeking employment elsewhere. You never know when the city will lay you off! Thanks to everyone for their encouraging words!